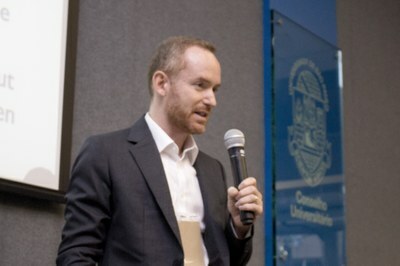 The first conference of the Intercontinental Academia on the subject of “Time”, on April 21, addressed what is known about the history and the possible future of the universe, as well as the concept of “arrow of time,” which posits only one direction for the flow of time, and considers that past and future are different, a notion closely related to cosmology. The lecturer was the theoretical physicist Matthew Kleban, from New York University, who dedicates himself to the study of string theory and the early history of the universe. He noted that, contrary to what is assumed by the arrow of time, there are physical laws that posit dual direction, i.e., symmetry between past and future, although he stressed that this idea is still very confusing to physicists. Continuing with his presentation, Kleban addressed the current contents of the universe. He said there are about 100 billion galaxies, each with hundreds of billions of stars. The Milky Way has nearly 300 billion stars and a colossal black hole exists in the center of the galaxy, called Sagittarius A*, with mass equivalent to 4 million Suns, but with radius (at least in theory) only 17 times the size of the Sun. The solar system also orbits the galactic center, but the orbit lasts 200 million years. The panel on galaxies was used by Kleban to introduce his comments about the expansion of the universe. The central figure here was American astronomer Edwin Hubble (1989-1953), whose telescope in the 1920s was able to observe approximately 50 galaxies (the Hubble Telescope, orbiting the Earth for 25 years, allows us to observe 10,000 galaxies when aimed at each 10/1,000,000 slit of the heavens). Kleban explained that Edwin Hubble noticed something odd in the galaxies: the farther away they were, the faster they moved away from Earth. This observation led to the so-called Hubble’s Law: v = Hd, where H is a constant with units of 1/time. With this law, it became possible to calculate when the entire content of the universe was bundled together, so to speak: 14 billion years ago. Hubble’s observations about the expansion of the universe created a profoundly strange idea, namely, the notion of the Earth as the center from which everything moves away, a kind of resumption of Ptolemy’s geocentrism. With regard to the future, some believe that the expansion will continue infinitely; the speed of expansion will decrease gradually, but will never cease. According to this hypothesis, Kleban explained, stars will eventually consume all their fuel and the universe will become cold and dead, even though this would probably not be the end, which would occur later. Other researchers think the expansion will reach a maximum level and the universe will then begin to contract. After a finite span of time, density will be infinite, a singularity that is called “Big Crunch” (major collapse). There are also those who consider that a threshold situation is possible between these two scenarios. One of his main interests is the so-called “multiverse” of string theory. “In string theory, the Big Bang was not a singularity or the beginning of time. It was the birth of a ‘bubble’ of a new ‘phase’.” The multiverse could harbor the emergence of numerous such bubbles.